Railpictures.ca - John F. Bromley photo, Dan Dell'Unto coll. Photo: A snow/sleet mix appears to be falling on this mid-April (!) Saturday, as passengers crowd the streetcar platforms at the corner of Dundas Street West and Bloor Street West waiting to board a streetcar and get out of the weather. TTC A-13 class PCC 4738 (a former Birmingham car purchased secondhand) leads the pack signed up for the Dundas route, turning from northbound Dundas to westbound Bloor on a diversion west to Park Loop (once located at the north end of High Park off Bloor) during construction of the nearby Dundas West subway station on the yet-to-be-opened Bloor Danforth line. Other photos taken by Mr. Bromley that day show some Dundas streetcars were still looping at nearby Vincent Loop, so this may have been a Runnymede branch car only going as far as Bloor and diverting. Puddicombe Motors is pictured on the right at the southwest corner of the intersection (a large local Ford/Mercury dealer in the area). And, note that stylish 1960′s Buick on the left! John F. Bromley photo, Dan Dell’Unto collection slide. | Railpictures.ca – Canadian Railway Photography – photographie ferroviaire Canadienne. Copyright Notice: This image ©John F. Bromley photo, Dan Dell'Unto coll. all rights reserved. Caption: A snow/sleet mix appears to be falling on this mid-April (!) Saturday, as passengers crowd the streetcar platforms at the corner of Dundas Street West and Bloor Street West waiting to board a streetcar and get out of the weather. TTC A-13 class PCC 4738 (a former Birmingham car purchased secondhand) leads the pack signed up for the Dundas route, turning from northbound Dundas to westbound Bloor on a diversion west to Park Loop (once located at the north end of High Park off Bloor) during construction of the nearby Dundas West subway station on the yet-to-be-opened Bloor Danforth line. 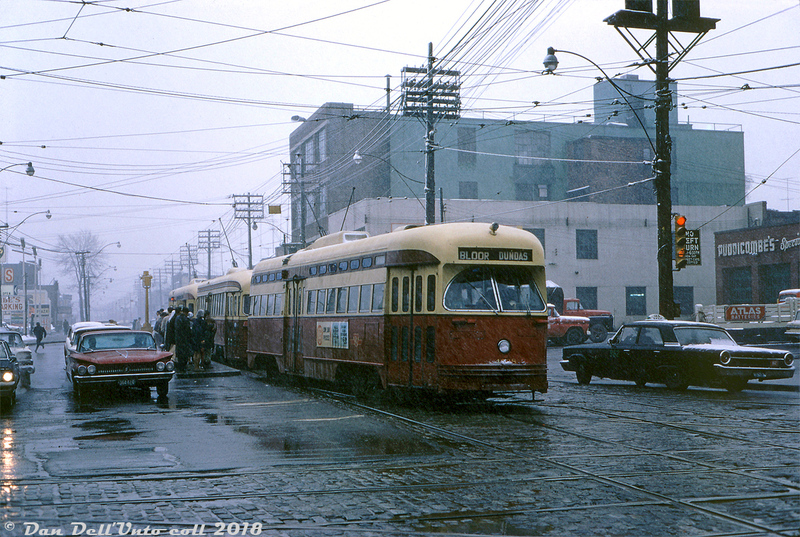 Other photos taken by Mr. Bromley that day show some streetcars (probably King cars) were still looping at nearby Vincent Loop; the diversion here was apparently just the Dundas cars on the Runnymede branch only going as far as Bloor and diverting west. Puddicombe Motors is pictured on the right at the southwest corner of the intersection (a large local Ford/Mercury dealer in the area). And, note that stylish 1960's Buick on the left! John F. Bromley photo, Dan Dell'Unto collection slide.